Woohoo, it's Friday! To kick off the weekend I have some fun cremes from Glisten and Glow. These colors are bright and fun. Perfect for the weather here this week considering the fact that is was 98 degrees here the last two days (unfortunately). 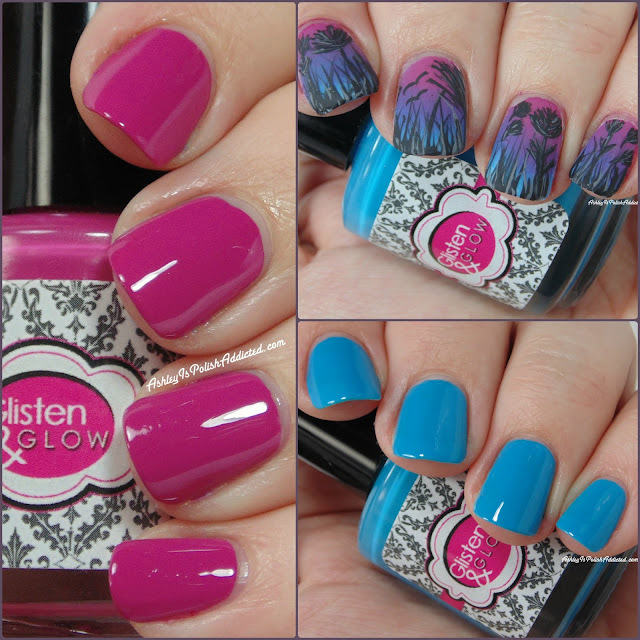 However, these also have amazing formulas that work wonderfully for nail art so they will be great year 'round. Even if you don't live on the surface of the sun, like me. Both of these polishes are from Glisten and Glow's Experience the Islands Collection (along with two other polishes). This isn't my first experience with Glisten and Glow cremes (you can see my review of the Winter Remix Collection here), and Jill definitely has her creme formula down. These were both smooth and creamy with no issues. I am showing 2 coats plus topcoat. ATV in Aruba is a rich berry mauve. This one is deep enough to be perfect for fall/winter as well as bright enough for spring/summer! Snorkel in St. Thomas is a bright sky blue that has a hint of a dusty quality. I also used both of these to create my background in this mani! These retail for $7.50 each, or $30 for the complete collection. Make sure you check out Glisten and Glow at all of the links below!